Another one of our great national institutions, the Boy Scouts of America, has officially lost its way. An organization with an impressive history of over one century has buckled to the insidious forces of political correctness. The latest sign occurred this week as the Boy Scouts formally opened their doors to girls. In 2018, girls will be able to join the Cub Scout program and the following year will become eligible to attain the highest rank, Eagle Scout. This act of inclusion was wisely not followed by the Girl Scouts, which will remain an exclusively female organization. According to Jacqueline Alexander, CEO of Girl Scouts of Louisiana East, "I think people will decide what they want to do and we’re just going to continue to do what we do which is offer the best program for girls. I think people that have sons and daughters realize there’s going to be differences all through their lives ... it’s never going to be a one stop shop." Of course, there are biological “differences” and that is what God created, two sexes with different desires and abilities. We should be celebrating the differences between boys and girls, not trying to eliminate them. Unfortunately, our society today does not appreciate those natural distinctions. Social justice warriors are working overtime to eliminate “sexism” and that usually means attacking masculinity. Thus, in an age of suffocating political correctness, it is not easy growing up as a boy. The full-scale assault on males is now starting very early in a young boy’s life, while he is still in elementary school. Often, boys are told they are too rambunctious and disruptive in class and are prescribed drugs to “calm down.” Obviously, they are just acting like normal boys, but that is not appreciated in today’s toxic environment. The result is predictable as more boys are dropping out of school and not completing their education. Young women are now attending college and graduate school in ever greater numbers. This is translating into more opportunities in the workplace for women, but more problems for men, who are having a harder time finding employment without a college education. This dangerous trend for young men in our country needs to be reversed, starting in childhood. It is healthy for boys and girls to have outlets where they can participate in activities with members of their own gender. This is very important in their development into successful young adults. There is nothing wrong for boys to learn about sporting events and the outdoors with other boys. Likewise, young girls should be able to enjoy a range of activities with other girls. This type of bonding and education allows for the positive development of both boys and girls in our country. Sadly, the war on traditional gender roles in America has been very successful. In recent years, there has been an explosion of initiatives to cultivate transgender children and adults. This trend has definitely impacted the Boy Scouts, an organization with a Judeo-Christian background of strong moral values. Needless to say, many Americans were disturbed when the Boy Scouts opened their doors to gay and transgender scouts and adult leaders. This was part of an effort to be “inclusive” to non-traditional Americans who wanted to share in the experience of becoming a member of the Boy Scouts of America. Now, by opening up to girls, the Boy Scouts have removed one of the last bastions of male fellowship for both boys and young men. It was a unanimous decision by the Board of Directors to “welcome girls.” While it may have been financially motivated, the message is clear, the Boy Scouts of America has changed forever. 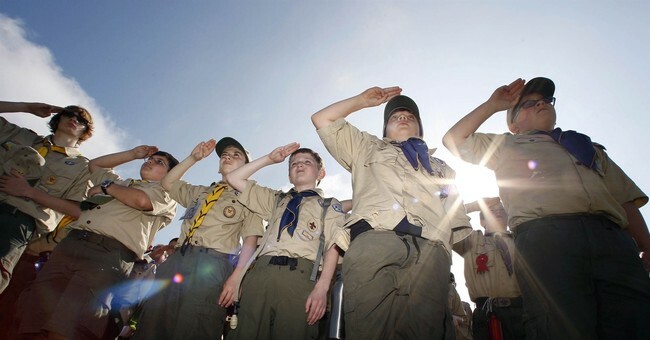 It has morphed into a politically correct organization, no longer the same group that just four years ago highlighted a “morally straight” Scout Oath. In pursuit of more members and revenue, and support from social commentators, the Boy Scouts of America has abandoned its rich history. Over the years, many corporate and political leaders have credited their experience in the Boy Scouts as being extremely instrumental in their development. Clearly, the Boy Scouts has been very successful in cultivating the type of leaders this country needed, so why have all of the changes been enacted? Simply, this is just another indication of the power of both money and political correctness. Despite an impressive track record, extending for many decades, of providing essential training and leadership to the young men of America, the Boy Scouts succumbed to these formidable forces of destruction. It is another troubling warning sign of what is wrong in America today.